Size of Male: 30-45 lbs., 15-18 in. Size of Female: 25-40 lbs., 15-18 in. The American Water Spaniel is considered an original American dog breed, created in the Great Lakes region of the U.S. in the 1800s. This is a rare breed but they make excellent family pets. They are friendly, devoted, affectionate and very eager to please. They are easily trained and they love children. The exact origin of the American Water Spaniel (AWS) is uncertain, but they seem to have been developed in the Great Lakes region of the United States in the mid-1800s. They are the state dog of Wisconsin. 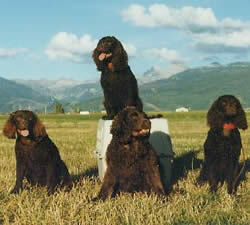 This dog breed may have been a cross between an English Water Spaniel (extinct) and the Field Spaniel. Or they may have been a cross of the English Water Spaniel, Curly Coated Retriever, Field Spaniel, Tweed Water Spaniel, Irish Water Spaniel and the “Chessie,” or Chesapeake Bay Retriever. No one knows. The American Water Spaniel is an active, intelligent dog who is friendly, confident and obedient. They are very enthusiastic working dogs but they also make great family pets. They tend to be easy going dogs and they are very loving and affectionate. They can be sensitive, as are many spaniels, and they enjoy being with their people. They usually get along very well with other pets and they love children. Dog training is typically very easy for these dogs. This breed has a lot of energy so they do well with an active family. They particularly enjoy swimming and water sports. Make sure they get plenty of exercise. Living Environment – The AWS is a very active dog but they can adapt to living in an apartment if you make sure they get plenty of daily exercise. Long walks are good. They also enjoy off-leash runs in a safe and secure area. Of course, these dogs also do very well in a country setting, especially if they have their own fenced yard. They do not do well as kennel dogs since they bond very closely to people. Grooming – Grooming for this AWS is generally easy. They can have a curly coat or a wavy (marcel) coat. In either case it should be brushed regularly. They should not be bathed too often since bathing removes the natural oils in the coat. This dog breed does not shed very much. Diet & Exercise – Dietary needs are considered normal for this dog breed. They do require plenty of regular exercise. This is a very active breed and they retain strong hunting instincts. They enjoy a good run. Even if they have their own fenced yard they will appreciate an off-leash run periodically so they can really stretch their legs. If you can become involved in any field activities with them they will be very happy. They also enjoy water sports and are natural water retrievers. Health – The AWS isn’t prone to any particular dog health problems but a few may appear at times in this dog breed, including canine hip dysplasia, cardiac problems, cancer, diabetes, dog allergies, canine hypothyroidism, epilepsy, follicular dystrophy and cataracts. If you are interested in the AWS you should talk to a breeder about possible health problems in the breed. The American Water Spaniel is an intelligent breed and they are very eager to please. Dog training is usually very easy. Given a chance, they can do very well in obedience, rally, agility and other dog activities. These dogs can be sensitive at times so you should never use harsh training methods with them. They respond best to positive dog training methods (praise, rewards).